Everyone's visiting DC, and we are out of sidewalk space. - I bet you think this blog is about you. Everyone's visiting DC, and we are out of sidewalk space. Work finally slowed down to an extent on Friday, allowing me to actually eat lunch with Laura (other planner coworker) and Anna (the third of three new additions to the team) instead of frantically shoveling in food at my desk. We talked at length about DC neighborhoods and where we might move and summer vacation plans. Though there weren't any ridiculous late nights, for most of the week I was unexpectedly the most senior person in the office, so I had precious little time to complete my own mountain of tasks while solving other problems that came up. I can add the following to my accomplishments as a result: spoke on the phone with our access card vendor and can confirm they are terrible, invented a triage system for our backlogged subcontracts, mollified several Big Federal Agency staff, and vowed to talk about setting up actual delegation of authority next week. 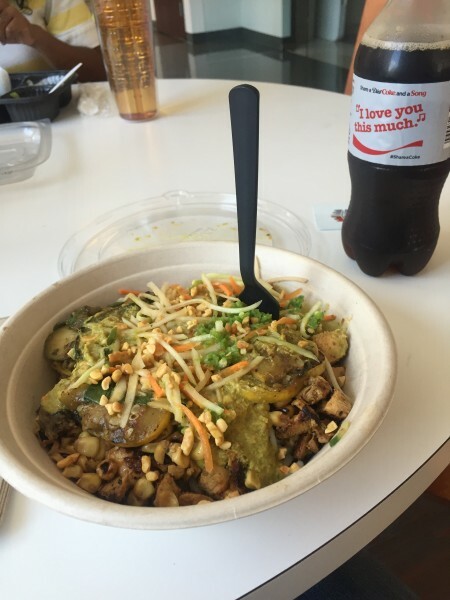 Lunch was this green curry noodle bowl with chicken, corn, and squash. I know you were curious. I also managed to pay my credit cards and reassess our household finances before I left. Sooooo close to paying off these buggers (as well as Navient, the student loan bugger extraordinaire). After work it was disgustingly hot, and for the first time in at least two weeks I opted to take the Circulator. It took a maddeningly long time to arrive, making me wish I had taken the train or at least changed into shorts for the trip. But I made it to Kevin L.'s house as planned for some beers with Adam W., who is in town from Pretoria for a couple of weeks. We had some college nostalgia and met other folks gathered there, then I moved on to DC9 to meet Ian and company while he was in town from Atlanta. He was with B, Lajuan, and Jen and we caught up some at Sheena's bar. 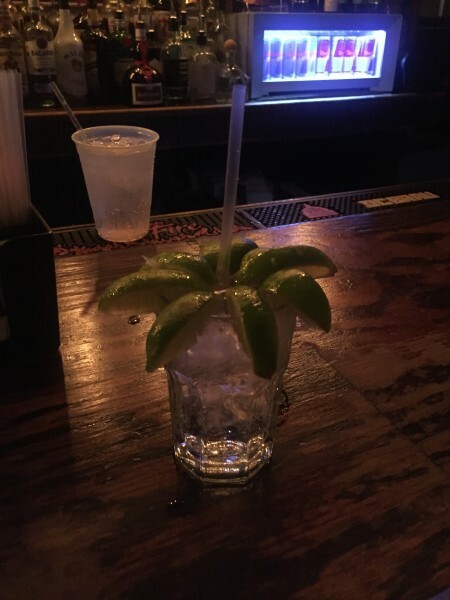 For some reason we also got into a playful argument about what fruit garnishes go with which drinks, and Ian insisted that vodka sodas come with limes. All service staff present vehemently disagreed, that lemon wedges were the correct answer but customers repeatedly demand otherwise. And this is what losing an argument with a bartender looks like. Then we walked Ian back down to his hotel, which had had no electricity since mid-afternoon. There was a random spotty Pepco outage yesterday, and it appeared that he would be in the clear because all the blocks leading up to the hotel had lights. But no such luck. So he crawled up to his sixth-floor room and we came home to look at the Emmy nominations (which please me greatly!). Today we have been pretty lazy. I insisted on going running since I have a 5K next weekend. Despite the continued disgusting heat, I managed 4.25 miles by toting around extra water. That puts me over 20 miles for July, a monthly milestone I rarely reach! Now B has dinner about ready so I'm off. Happy weekend, LJ.